Immigration Minister John McCallum confirms that 10,000 applications for reunification of parents and grandparents will be accepted this year, despite a 5,000 annual cap that was in place when the Liberal government re-opened the program earlier this week. 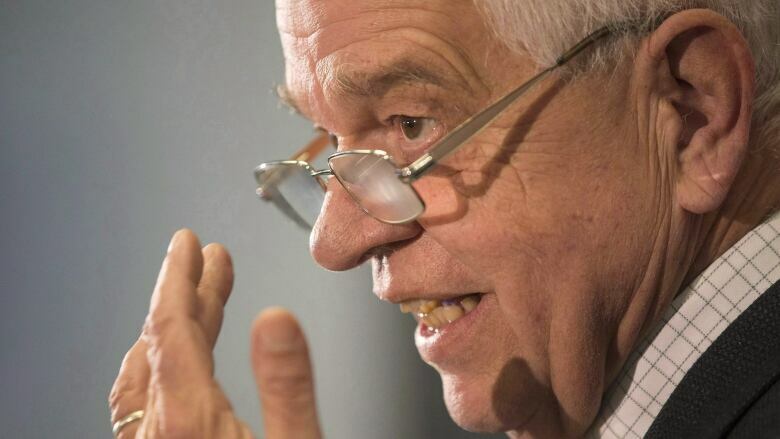 Immigration Minister John McCallum says 10,000 applications for reunification of parents and grandparents will be accepted this year, despite a notice posted on the government's web site earlier this week cautioning applicants that a 5,000 annual cap was still in place. In an interview Friday on CBC News Network's Power & Politics, McCallum said the government received over 14,000 new applications from Canadians who want to sponsor their parents and grandparents after it re-opened the program on Monday. McCallum said the government will accept 10,000 applications in keeping with the Liberal Party's pledge to double the 5,000 cap previously put in place by the Conservatives. "We've kept the first 10,000 — so those 10,000 will be up and running," McCallum told host Rosemary Barton. "So we are certainly honouring that commitment." A notice posted on the government's web site Thursday said the application period is now closed and that the Immigration Department will retain the first 10,000 "complete" applications. "More information on this increase will be forthcoming, including information on when we will be returning applications not added to the inventory," the notice said. Conservative immigration critic Michelle Rempel said earlier this week it was "irresponsible" of Prime Minister Justin Trudeau to promise more than the government can deliver. "Keeping a realistic goal of 5,000 applications a year was part of our Conservative government's initiative to be prudent managers of government," Rempel said in a post on Facebook Monday. In 2011, the Conservatives put a freeze on new applications in an effort to reduce a massive backlog of eight years. An annual limit was introduced when the program reopened in 2014. On Twitter, Rempel said the Liberals had a new mantra "to over promise and under deliver." According to the latest data posted on the Immigration Department's website, the wait time for reunification of parents and grandparents is upwards of four years with the government working on processing applications received on or before Nov. 4, 2011. ​"The wait times are way too high," McCallum said Friday, "and this is one of the issues we have to address." The minister said the Liberals are committed to reducing wait times, not just for those sponsoring parents and grandparents, but also for those sponsoring spouses and common-law partners, children, and caregivers. "That's a huge item on our agenda, which we will be addressing in the coming months," McCallum said. Canadians who want to sponsor their spouses have also grown increasingly frustrated with long processing times. In December 2014, amid complaints of growing delays, then–Immigration Minister Chris Alexander launched a one-year pilot project intended to issue open work permits more quickly to the spouses of Canadians already living in the country but waiting for permanent residency. According to the Immigration Department's website, the current wait time for sponsoring a spouse or common-law partner is over two years if they live in Canada and upwards of 17 months for those living outside the country. "Over the years, there have not been enough resources devoted to the spouses," McCallum said. "I think that's unacceptable and that is one of the things we are determined to address." The Liberals have budgeted an additional $25 million to reduce application processing times in 2016-17, followed by an additional $50 million a year for the next three years.